Venezuela announced it will pull out of the OAS. This is getting compared to Cuba, which was suspended in 1962 and currently refuses to rejoin even though it has been told it can. There are, however, important differences, which all revolve around one main fact: in 1962 Cuba was operating from a position of strength. Fidel Castro thumbed his nose at the OAS and the United States, and was in complete control of his country. For Nicolás Maduro, the opposite is true. He's facing disaster at home and Chavismo is at its weakest. For Venezuela, then, this measure is an act of desperation, a way of avoiding unpleasant votes and embarrassing pronouncements. 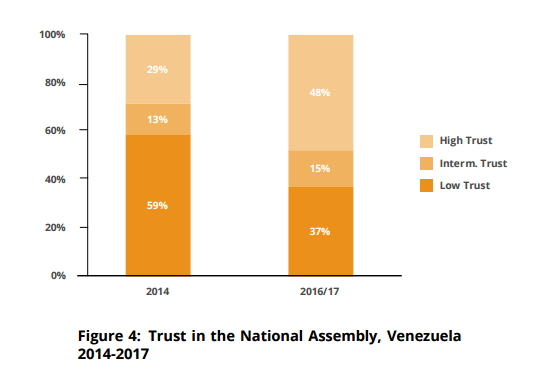 It highlights to everyone how bad things had become in Venezuela and serves mostly to isolate Venezuela more. Few people see this in black-and-white ideological terms, which is the Cuba-type frame that Maduro wants to project. One critical question now is how long do Bolivia and Ecuador in particular insist on pretending everything is fine? They were the key voices blocking any OAS action. In Episode 32 of Understanding Latin American Politics: The Podcast, I was very excited to chat with Lulu Garcia-Navarro, host of NPR's Weekend Edition Sunday, who of course reported for many years from Latin America. We discuss some of the political stories in Latin America that left the biggest impression on her, especially Venezuela, Brazil, and Argentina. And, happily (not to mention selfishly! ), she affirms that academics have had a positive impact on helping a broader audience understand the region. Cuban state television is trying to get slicker and more immediate to attract young Cubans. There are limits, of course, because of what the state will allow you to say, and the young people working there harbor no illusions in that regard, but feel they can push the envelope at least a little bit. This is also where U.S. soft power should come in. Old-style, rabidly anti-Castro transmissions seemed to have little impact in the past and certainly will have minimal effect now. I would guess young Cubans want to hear about the future, not about the Cold War. They don't want to hear about the Bay of Pigs. There are a lot of things that could connect the U.S. and young Cubans, even as simple as hip-hop or sports. That's the audience we want to engage. Death's End (translated in 2016) is the third in the Remembrance of Earth's Past trilogy and it is incredible. Its scope is immense, centering on the "dark forest" problem in the universe, namely that civilizations immediately try to destroy each other when they discover a sign of life. Therefore often the best idea is to hide. This third book is by far the best, and somehow manages to both be apocalyptic and hopeful. After reading, you'll be reminded (or at least I was) of how your life is both meaningless and meaningful at the same time. He deftly deals with the politics and religion of coming into contact with hostile forces. First earth tries a UN-type unified response, but over time that breaks down and there are violent clashes that result as humans try to figure out the best way to continue the species (this was the key theme in Book 1 as well). Deterrence was an important theme in Book 2 and its ramifications continue into Book 3. Religious beliefs shift and adapt, always looking in vain for a savior. Eventually a lot of human attention is spent on trying to make sure humans and Earth are remembered at all. The science is remarkable. Discussions of light speed, dimensions (two-dimensional space becomes a major part of the story) and the structure of the universe itself are intense but not overwhelming. Lastly, it makes you wonder whether we should make any effort to find extraterrestrial life. It might not turn out well. The “scenario” Maduro referred to consists in generating violence and deaths before blaming the Venezuelan government for allegedly violently attacking political opponents. Then the plot leaders would demand immediate elections, ahead of Maduro's official end of term in 2019. The nonsense is the same, and it is also self-defeating because assuming you believe your own nonsense it means underestimating your real opposition. 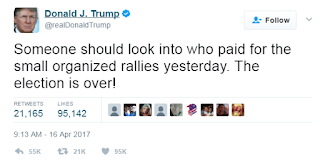 It constitutes an effort to portray legitimate opposition to legitimately polarizing policies as paid for by outside agitators. Neither president is capable of self-reflection, through some combination of narcissism and desperation. The Maduro one is worse, though, because it claims there is an evil plot to...have democratic elections as the constitution provides. The horror! There will be dueling protests in Venezuela today. The opposition wants massive turnout, while the government is trying to turn out its own supporters and deploy colectivos basically to intimidate people. Nicolás Maduro has made creepy reference to handing guns to civilian militia as well, with a "civil military plan." That can't mean anything good. I feel like the opposition's main hope at this point is to increase the number of soft-liners within the government in order to make it follow the constitution. We already know there are fault lines. Those soft-liners have no love for the opposition (which, I would think, holds them back) but they value democracy. They see the devastation around them and when combined with large numbers of Venezuelans on the streets, they find it harder to stand behind Maduro. Some of these soft-liners are undoubtedly in the military as well, though how that plays out is unpredictable because it depends a lot on rank. In the 1980s President Ronald Reagan prioritized funding the civil war in El Salvador, which was extraordinarily violent and prompted large scale emigration. 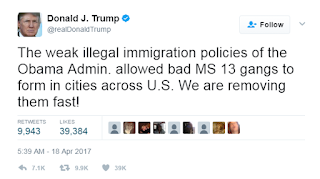 Many migrants went to California, especially Los Angeles, where over 30 years ago they formed gangs like MS-13 as a means of protecting themselves from existing gangs. 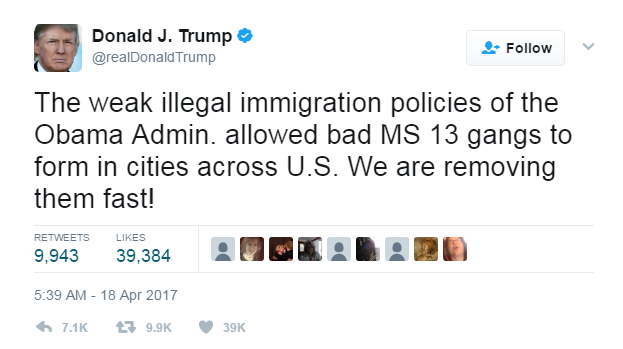 Over time members of MS-13 became entrenched in their communities and spread out across the country. Prior to the civil war, there had not been a large migrant stream from El Salvador. This was a phenomenon created by U.S. foreign policy, specifically the Reagan administration. This process began when Barack Obama entered his 20s. But, naturally, he is to blame. I hadn't read Ray Bradbury's Fahrenheit 451 (originally published in 1953) in many years. It's still so relevant for today. Not simply for the idea of book burning/banning, which of course is central to the story and is timeless, but for the idea of numbing oneself with entertainment. A major theme is how many people accepted the idea that thinking hard about difficult issues and dealing with complexity were overwhelming. Entertainment, which actually interacted with you through huge screens on the wall, made you feel good. By banning books the state was just making your life a lot easier. Even going out for walks was unusual and people who did so were targeted, even for death. If you're out walking with only your own thoughts, you must be dangerous. Anytime you stopped being entertained, you might think. Children were therefore taken away right after birth, so they could be properly taught to be entertained and learn not to see more than one side of a story. And, finally, professors are the main targets. Bradbury would fully understand the attacks on the humanities and on academia in general. Comparisons across time are never perfect but they can serve to give us a grip on current events. By the same token, inapt comparisons can make things more confusing. That is the case with comparing the U.S.-North Korea confrontation right now with the Cuban Missile Crisis, which The New York Times is pushing. While all historical analogies are necessarily imprecise — for starters, President John F. Kennedy dealt with the Soviets and Fidel Castro in a perilous 13 days in 1962, while the roots of the Korean crisis go back a quarter-century — one parallel shines through. When national ambitions, personal ego and deadly weapons are all in the mix, the opportunities for miscalculation are many. I don't see anything shining. The Cuban Missile Crisis had its roots in the Bay of Pigs, which JFK inherited and did not want. The North Korea situation now has its roots in Donald Trump's undiplomatic and unwise tweeting. JKF's ego/manliness was not particularly tied to the crisis--he felt he had to respond because in the Cold War context, he would get hammered at home and, he felt, the Soviets would feel emboldened. Timing is therefore a lot different. Trump could've achieved a lot more by staying quiet and working with the Chinese. Instead, I get the impression that he's following some predetermined series of negotiation steps that worked when he built apartments in New Jersey or something. 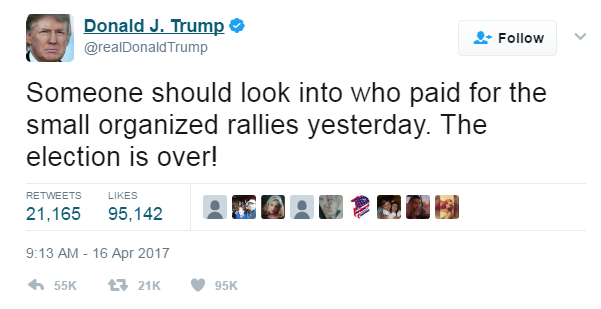 He actually intentionally sparked this crisis himself when he didn't need to. I can't imagine JFK wanting to do the same with Cuba, which he preferred not to hassle with. The Cuban Missile Crisis was resolved by skillful back-channel diplomacy. Since "skillful" does not apply to the current administration's diplomatic repertoire, we can only hope someone with sense is given the task of working with the North Koreans through the Chinese. And indeed, that is the other problem with the comparison--we don't have easy back-channel avenues for North Korea. "We're going to abandon the failed policy of strategic patience. But we're going to redouble our efforts to bring diplomatic and economic pressure to bear on North Korea. Our hope is that we can resolve this issue peaceably," Pence said in an exclusive interview at the DMZ. I have no idea what "this issue" is. There are myriad issues with North Korea and the U.S. cannot force any of them without going to war. With JFK, there was only one issue--remove the missiles. I doubt North Korea even knows what Trump wants. I am not sure Trump knows what Trump wants. That's really the problem. More than ever, there is talk of Latino players "playing with emotion." More specifically, we hear how this has discomfited white players, especially older ones. Some of it is just youth. Hall of Famer John Smoltz, for example, said, "I lean towards being professional." That itself was in response to Goose Gossage, who whined about Bryce Harper not having respect for baseball. But most of it is focused on Latino players. José Bautista's bat flip in the 2015 playoffs is now iconic, and ignited a debate that continues. For U.S.-born white players, this was disrespectful. Exactly why a brief moment of exhilaration was disrespectful is never explained. It goes under the two categories of "unwritten rules" and "this is the way we've always done it." Under these rules, you show no emotion and then fight if someone slips up and lets a little emotion out. Now these immigrants are bringing their foreign ways. But Smoltz's comment there, that "a lot of these guys are enjoying themselves, maybe they'll get it out of their system in about two weeks" -- that's pretty much the whole baseball thing right now, isn't it? The whole culture war in baseball, the "keep millennials engaged" business, the how-do-we-keep-the-game-relevant discussion … you can see the whole damned fight in that comment. “When I played (I was) very old school as far as you don’t show anybody up,” Karros said. “I was a non-emotional guy, very stoic. The irony now as a fan and as a player I like that bat flip. Now, if I were playing it wouldn’t be happening. But I think I’ve come to a point where I kinda like that sort of stuff and it adds some energy. We can only hope this is spreading. I feel like it will, for demographic reasons if no other. The number of Latino players is increasing, as is the size of the overall Latino population. This could well the last gasp of uptight whiteness. Let's stop worrying about bat flips and excitement. Anyhow, we all know the best way to put an end to it is to stop giving homers. Why I Write is a nice little collection of four George Orwell essays, with the second (The Lion and the Unicorn) being the longest by far. So long as I remain alive and well I shall continue to feel strongly about prose style, to love the surface of the earth, and to take pleasure in solid objects and scraps of useless information (p. 9). "The Lion and the Unicorn: Socialism and the English Genius"
This is a lengthy treatise on what is means to be British, with World War II has the backdrop. His appraisal of Neville Chamberlain could also work for Donald Trump: "His opponents professed to see in him a dark and wily schemer, plotting to sell England to Hitler, but it was far likelier that he was merely a stupid old man doing his best according to his very dim lights. It is difficult otherwise to explain the contradictions of his policy, his failure to grasp any of the courses that were open to him" (p. 28). Yet as critical as he is, he has complete disdain for whiny intellectuals who offer no constructive suggestions, largely because they know they'll never have the responsibility of actually making decisions. He bogs down in his discussion of the superiority of socialism over capitalism, because writing during the war (the essay was published in 1940) he is focused on Germany's advantages and argues that capitalism is incompatible with building a war force. The U.S. has shown clearly that profit and war can go together perfectly, and indeed too perfectly. * Orwell was quite wrongly convinced that winning the war would open people's eyes to the benefits of a more planned economy. Thomas Piketty wrote about how world war was critical for reducing inequality, but Orwell mistakes that for radical ideological change. It gets hard, frankly, to square Orwell's excitement about a planned economy with his stated disgust for totalitarianism. He never discusses, for example, who makes decisions and what happens if people elect someone who wants to overturn it all. His discussion of India's inability to be independent is also both wrong and condescending. Ironically, both in essays and novels Orwell was very good at knowing what he was against but his vision of what should be is hazy. A short piece on the barbaric yet bureaucratic process of the British Empire executing prisoners in Burma. We don't even know what the individual did, but we know it was rather a bother to kill people sometimes because it delays breakfast. In this essay Orwell claims the English language is dying, and chooses a few politically-oriented passages to criticize as illustration. Some of these come from professors (even *cough* a political theorist) and communists, neither of which has ever been known to be proficient in the art of writing, so it's a straw man argument from the start. He starts to sound like Ernest Hemingway with his directness mandates. But his basic instructions make sense. Avoid overused phrases and pretentious diction, for example. Though I must say his list of pretentious words (element, eliminate, etc.) seem pretty mundane to me. He even hates cul de sac and everyone calls it that, so I guess on this one the dictionary won and he lost. He says that "fascism" has little real meaning so should be avoided, which I agree with for today, though of course his earlier essay worked to precisely define the term. *Just after publishing I discovered one of my colleagues in History, Mark Wilson, recently published an award-winning book on this very topic. Thanks to my student Nashaly Ruiz-González for pointing out this article about the mirror image of the immigration debates in the United States and in Argentina. Mauricio Macri has been aping Donald Trump's anti-immigrant language and policy, and is also getting an indignant response. There were recently protests/strikes to highlight how much immigrants do in Argentina. "Soy mexicano, soy peruana, soy boliviano, soy psicóloga, soy costurera, soy estudiante.... soy migrante. También aporto a tu economía, a tu cultura, a tu sociedad", sintetiza una convocatoria replicada en las redes sociales. Just like the U.S., Argentina is a country of immigrants but more hostile to the non-white variety. Update: Fittingly, Macri will be heading to the White House in a few weeks. They have a lot in common. In our podcast conversation, Leiv Marsteintredet and I talked a little about how presidential impeachment in Latin America had become like the equivalent of a parliamentary no-confidence vote, something I've blogged about before. We also talked about the 2009 coup in Honduras, which occurred in part because there was no impeachment process that could be followed. Another part of that was the fact that there was no legal way to really deal with proposing changes to presidential terms. We both knew the latter had changed, but weren't sure about impeachment. But impeachment was indeed added to the constitution in 2013. Leiv has argued that Latin American presidentialism has become more flexible over time, which has decreased military intervention. One problem for Honduras in 2009 is that its institutions were inflexible. But this raises important questions about process. Should it be OK to resolve institutional conflict through impeachment, even if the dispute is over policy rather than crimes? We know Dilma Rousseff was not being accused directly of a crime--she was removed for policy reasons. Does it damage democracy over the long-term or should we accept it as an unpleasant but useful way to avoid military intervention or just violence in general? In other words, is acceptance corrosive? 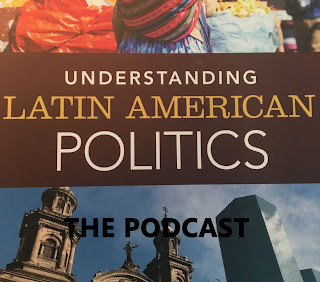 In Episode 31 of Understanding Latin American Politics: The Podcast, I talk with Leiv Marsteintredet, who is Associate Professor of Latin American Area Studies at the University of Oslo. His main areas of study are presidentialism and constitutionalism in Latin America. I ask him about whether presidentialism is in crisis (or whether it's just always in crisis) and how this plays out across the region. Reading Admiral Kurt Tidd’s 2017 Posture Statement for U.S. Southern Command, two things jump out at me. First, there are repeated mentions of budget constraints. Second, there are repeated mentions of Middle Eastern terrorists, including ISIS. In short, at least from the outside this sounds like a way to get Donald Trump’s (or at least Jared Kushner’s) attention at a time when he is talking about increasing military budgets and ISIS. Threat networks engage in a range of destabilizing illicit activities that further dangerous ideologies or generate profit. Violent extremist organizations like ISIS seek to radicalize and recruit vulnerable populations in the Caribbean and parts of Central and South America. Hezbollah members, facilitators, and supporters engage in licit and illicit activities in support of the organization, moving weapons, cash, and other contraband to raise funds and build Hezbollah’s infrastructure in the region. That’s some serious red meat right there. When John Kelly (who of course is now Secretary of Homeland Security) did his last posturestatement, he definitely discussed Middle Eastern terrorism but couched it with phrases like “we have not yet seen evidence of this occurring.” But if you need money and money might be available, you do away with the nuance. So we have a gradual expansion of SouthCom talking about such terrorists as more of an imminent threat in Latin America, which gets both the right and the alt-right excited. Go ahead and work with allies; go ahead and disrupt the financial networks. Just don't make this an excuse for ill-conceived intervention. 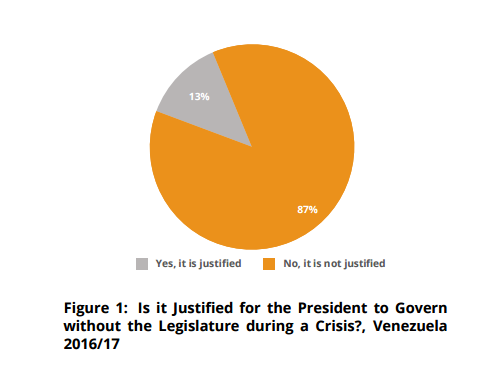 The Latin American Public Opinion Project at Vanderbilt has some brand new (October 2016-January 2017) survey data from Venezuela. Mariana Rodríguez and Liz Zechmeister just published a new AmericasBarometer Insights paper (it's been a while since one was published, so this was welcome). 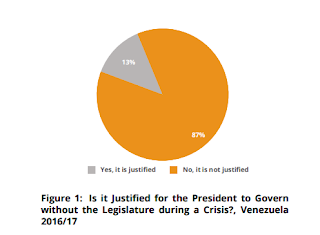 They show Venezuelans strongly disapprove of closing the legislature (a question they actually use in their normal battery, so obviously it's good to have in there). We can reasonably argue that the executive branch attacks on the legislature have made it more popular. 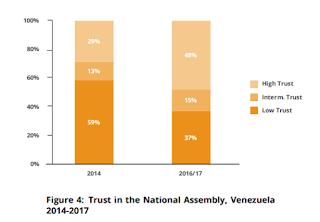 The authors further conclude that the recent attack will likely make Nicolás Maduro less popular. Since only 17% of Venezuelans think he is doing a "good" or "very good" job, he can't go a heck of a lot further down. The act placed numerous conditions on aid for Honduras, Guatemala, and El Salvador including certification that the governments were taking effective steps to address 16 conditions, including combating corruption, protecting human rights, combat human smuggling and trafficking, and improving border security. Nicaragua is a poor country and I don't tend to see depriving the poor as a great way of fostering democratization. It also has more than a whiff of forcing drug tests on welfare recipients. Plus, unless I am missing something, Ros-Lehtinen is talking about aid, whereas the bill is about loans. It's worth noting that some in the Nicaraguan opposition thinks it matters, though. I am liable to listen to Luis Almagro, clearly no shrinking violet on such matters, who does not support it. The OAS General Secretariat considers that the bill, in the context of the present legislature, is not a productive contribution to the tasks that the Government of Nicaragua and the this General Secretariat are carrying out in terms of cooperation for democratic, electoral and institutional strengthening in the country, that have as a direct reference the principles and values of the Inter-American Democratic Charter. Meanwhile, the Nicaraguan government issued a flowery and lengthy denunciation. The bids for Donald Trump's wall are now in, and some of the companies have released descriptions of their proposals. The upshot is that they're insane. Imagine making the wall a tourist attraction. Perhaps sip a cold beer (maybe even a Mexican beer) at the top of the wall while you stare off into the desert. Imagine storing nuclear waste inside it. Kinda like a moat, maybe? Imagine it containing artifacts. I'm not sure how that works, maybe it's embedded. Even worse, the artifacts might be Mexican. Imagine making it really slippery, with some sort of constantly flowing slime. Or, conversely, imagine no wall at all but a bunch of libraries and cultural centers. That too is a proposal, and probably one of the more sane ones. This is what we're currently doing in the United States of America. The Wall Street Journal has a piece on Guillermo Lasso's accusation of fraud in Sunday's presidential election in Ecuador. Especially coming from a conservative media outlet, the article does not reflect too well on Lasso's case. On Sunday, one of Mr. Lasso’s allies in his CREO coalition cited two other exit polls giving him the lead. However, one of the polls cited—by well-respected Informe Confidencial—was never conducted, said Santiago Nieto, the director of that polling firm. A private poll conducted by Informe Confidencial on Saturday showed Mr. Moreno leading with a 4.8% advantage over his opponent, said Mr. Nieto, adding that Mr. Lasso celebrated too early based on exit polls, which are often inaccurate. Ouch! We already know that exit pools are hotly contested and should be used with extreme caution. If you want an example, just look at the controversy about the Latino vote in the 2016 presidential election. But we should also know that you should not base an argument on an exit poll that never actually occurred. Also working against Lasso is that international observers did not detect fraud. The OAS, which is no mouthpiece of the left, has confirmed Lenín Moreno's victory. Further, the conservative governments of Argentina and Peru have already congratulated Moreno. And Ronald Reagan was a great president under whom there were remarkable advances for human rights in Latin American and around the world. Let’s leave it at that. Mike puts that in the context of Efraín Ríos Montt, who Reagan believed was a committed democrat, going on trial for genocide in Guatemala. Let's just get something out of the way. The notion that there were any advances, much less remarkable ones, for human rights in Latin America--or anywhere, really--under Reagan requires ignoring Mt. Everest-sized mountains of contrary evidence. And it should be noted that Abrams himself served in the State Department under Reagan in a human rights capacity, and his idea of promoting human rights was to attack human rights organizations. Those groups, meanwhile, could only respond that Abrams was so vicious that sometimes his attacks helped their cause. More recently, he was a vocal supporter of the coup in Honduras. In Episode 30 of Understanding Latin American Politics: The Podcast, I talk with Iñaki Sagarzazu, who is Assistant Professor of Political Science at Texas Tech University. He studies political communication, voting, and Venezuelan politics. The topic is Venezuela. Among other things, we talk about whether this was an autogolpe, the nature of divisions in the government, the international response, and we end on a depressing note about the military, agreeing it was fitting to end on a depressing note. The right is saying it will contest the results, so nothing is set yet. When the dust settles, more likely than not any given story will be framed in left/right terms. Assuming Moreno's victory holds, I think "a much needed victory for the Latin American left" will be by far the most common (TeleSur is hopping onto that bandwagon already). I'll come back to the point I made in an op-ed in February, which is that the left/right thing isn't necessarily a helpful way to understand what's going on. Fundamentally, this is mostly about the Ecuadorian right's inability to craft an effective message after years of demonizing Rafael Correa. Voters look to who is going to solve their problems. If we want to see this in left/right terms, the best way is to consider it an utter failure of the right. As in the United States, too much of the Latin American right is so immersed in its dislike for the incumbent that it spends no time actually developing policy alternatives. If there is a lesson here, it's for the right in Bolivia and Venezuela. If you want to win (and in Venezuela this is predicated on actually having elections, I know, but it was a problem even when elections were held) then find ways to appeal to people. And even if you do win, you have to govern. There will be other stories too, such as the 6% who voted null, and of course the right's dispute of the results. Unfortunately, though, I expect the "big win for the Latin American left" to dominate and people will cling to the "pink tide" imagery. You immediately notice how short Christopher Hitchens' Mortality (2012) is, and soon learn he had a much larger vision in his head. He was diagnosed with esophageal cancer in June 2010 and died 18 months later. It is his effort to show what it means to be, as he puts it, "living dyingly." It's about suffering, straightforward and without wallowing, without religion (of course, for the famous atheist) and with apparently no regrets, and with no small amount of hope. He keeps coming back to the saying "what doesn't kill you makes you stronger," which after his diagnosis he began to see as illusion. Some outcomes were just plainly not leaving you stronger, even if they put off death for a while. Almost fittingly, the prose is as tight as ever until the final chapter, which is just jottings he was writing in hospitals and never able to make whole. Some hours after the declaration by the Venezuelan Supreme Court, prosecutor (and Nicolás Maduro ally) Luisa Ortega said that the Supreme Court's action violated the constitution. This prompted a meeting of the Consejo de la Defensa de la Nación. That body issued a declaration read by Vice President Tarek El Aissami, framing the whole thing as a dispute between the legislative and judicial branches which, technically, it is, sort of, and for the court to review its own ruling to make sure "institutional stability" (which can be defined in any way you find convenient) was preserved. The core of the declaration is to call for dialogue. Who exactly will be engaging in dialogue is uncertain, given that all the government needs to do is rescind an illegal measure and actually allow the legislature to...legislate. And of course for a recall election to go forward as the constitution provides. Then it called for dialogue for the broader crisis, not acknowledging that the only reason there's a crisis is because the government is taking illegal measures and uses dialogue as a way to endlessly delay action. Finally, it took a gratuitous swipe at the OAS because they all hate Luis Almagro. Not really any other reason for that to be in there. Several possibilities come to mind. They are not mutually exclusive. 1. The Venezuelan government is preparing to back off the Supreme Court decision, and will claim that doing so was a major concession, then require concession from the opposition, thus leaving things the same while pretending to move forward. This is more of the "master plan" sort of explanation and assumes a lot of guile for Maduro. 2. There are real fissures already within the government, and Maduro et al are getting nervous about how long unity will last under duress so are already cracking. 3. Maduro is not certain what the Supreme Court is doing and there is too much chaos (or distrust?) for coordination. That would make this autogolpe even weirder. Update: LITERALLY one minute after I hit "publish" I saw this breaking story on the Supreme Court reversing its decision. Weird indeed.